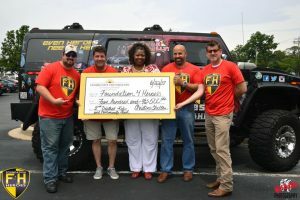 The Community Foundation of Southern Maryland congratulates Foundation 4 Heroes on receiving a $500 grant from the 2nd District Kids & Community Fund to provide coloring books and superhero capes and masks for hospitalized children as part of the Children’s Hospital Association’s upcoming Advocacy for Care Day. “We encourage the children to believe in themselves, fulfill their dreams, and overcome obstacles while lifting their spirits and being supportive of their unique needs,” says the foundation’s website. The 2nd District Kids and Community Fund is a donor advised fund established to give back to the local community through retaining corporate sponsorships and conducting fundraising events to benefit children and families with needs. For more information about applying for, or contributing to, the 2nd District Kids & Community Fund grant, visit the 2nd District Kids & Community Fund page. You can also learn more at the fund’s Facebook page.